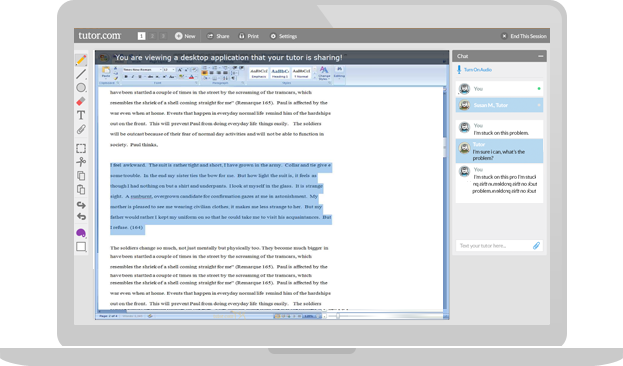 At Tutor.com, you work one-to-one with an essay-writing tutor on whatever you need help with. Our tutors will help you understand what makes a great essay, and how you can create one—whether you're working on a personal statement, book report, research paper, or creative writing assignment. Let's say you're writing an essay about a book you just read, but aren't sure where to start. A tutor can help you brainstorm ideas, write an outline, structure your paper, cite your sources, and proofread your essay once it's complete. Get help perfecting your next paper--find an essay writing tutor now.